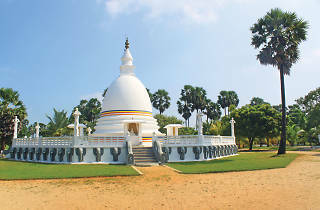 If important historic locations were chalked on a Sri Lankan map, the ancient port of Jambukola or Dambakola Patuna in Jaffna should be underlined many times for emphasis. What took place there on a full moon day of December (‘Unduvap Poya’ day) made the country take many leaps and strides forward, spiritually as well as materially. It was the year 249 BC. The country was basking under the glow of Buddhism newly introduced. A year before, Thera Mahinda had introduced the doctrine, and many devotees had taken to robes. The royal women were anticipating the arrival of Thera Mahinda’s sister Theri Sanghamitta so they too can get ordained. But in reality the arrival of the Theri meant a metamorphosis bigger than anything they had dreamt of. With Theri Sanghamitta, came a contingent which included artisans from 18 trades. They were people skilled in architecture, masonry, jewellery making, irrigation, engineering and other sophisticated arts. They would transform Sri Lanka completely. 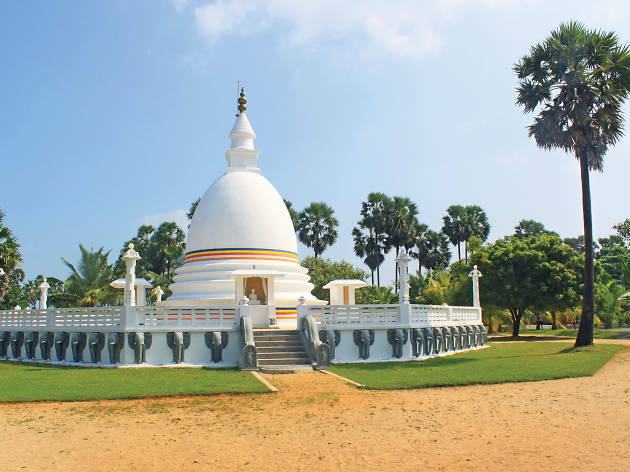 Most importantly she brought a sapling of the Bodhi tree under which the Buddha was enlightened, what was to become the holy of holies in Sri Lanka and the oldest historically recorded tree in the world. Today the port is marked by a temple of the same name. Palmyrah trees ring the shimmering stupa and white sands run down to the beach. The beach, if visited on dusk or dawn, will inspire you with its solitary beauty as the sun rises or sinks. Few beach revellers come here; it is given over to the occasional pilgrims. Dambakola Patuna ceased to be of any importance as a port a long time ago, but to this day, walking to the vast empty beach, you can imagine how bustling and important it would have been in its heyday.